Did you hear the amazing news? Old Navy Plus Size will now be available in store up through a size 30! Looks like Old Navy has seen the light and will begin carrying plus sizes in 75 locations, to eventually roll out to their 1000 doors! I remember the days of shopping for plus size suiting inside Old Navy, back in my retail management and commission sales days. Old Navy was my go-to for affordable, accessible, and relatable plus size classics. But then, they took away plus sizes and I had to find a new go to… Until today. Old Navy is to bring back plus size fashion, in store. Yes, you read this right. After an 11-year hiatus of carrying plus size in store (it has been since 2007? ), Old Navy will bring back plus size fashion, not just online but in store too! WHOA. Old Navy has had a rocky relationship with the plus size woman… Could this be one of the steps needed to change it? It definitely could be! Get this. Glamour reported that, for the first time, the full plus size range, up through a size 30, will be available in 75 of its physical Old Navy locations. And it will not stop there… as the brand receives feedback and learns how we like to shop, they will begin national rollout of their plus size departments to all 1,000 stores. Fair enough… I am curious about this. Ooohhhh, these mainstream retailers are feeling the shift, benefit, and opportunity of that plus size coin… From Target’s increased attention to their plus size floors, Nordstrom integrating plus sizing into its stores and floors, brands have been taking notice, but this news? Is shocking, exciting, but even more telling. Are brands waking up to this 21 Billion dollar market? Is this a sign of a shift? Of a moment that we can look back on to remember as a turning point? I would like to think and hope so! Old Navy To Carry Plus Sizes In Store?! 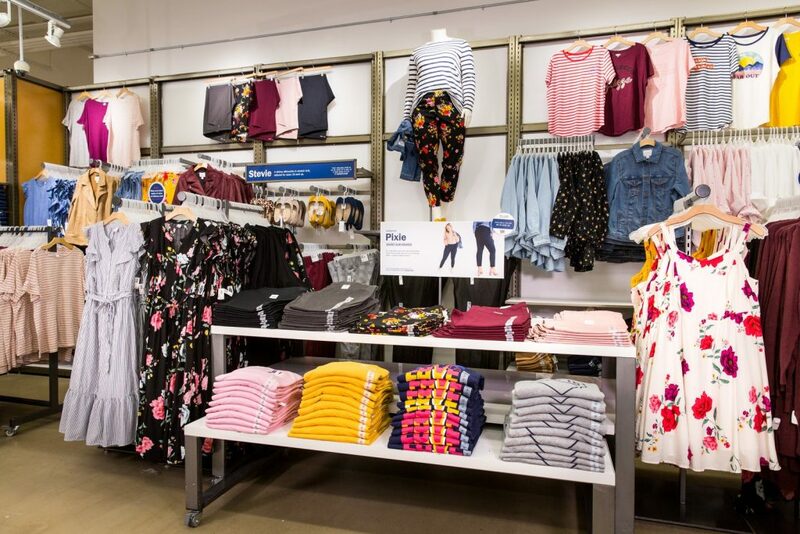 Not only will there be plus sizes in store, but just like every other department inside Old Navy, plus sizes, will have their own section and not as an afterthought. 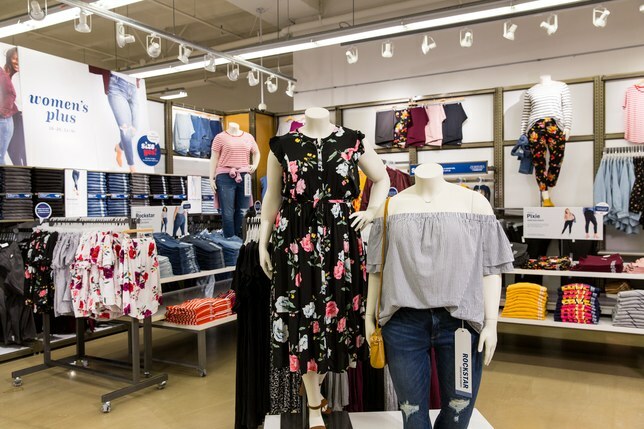 Old Navy wants to give us an uninterrupted shopping experience, stylized, merchandised, and with plus sized mannequins featuring over 175 different styles, in store, in sizes 16 to 30! So, what do you do in the meantime if your Old Navy is one that does not have the plus size department yet? Get this! If you want to try on a plus garment, but it’s not offered at that location, the store can have it shipped there for free! We appreciate this notion as they start their rollout to bring plus sizes to the masses. Are you going to be shopping OldNavy.com more with this news? This is curious, exciting, and we proceed with cautious optimism! Find out if your closest Old Navy will Carry Plus Size In Store here! How are you feeling about this revelation, news, and information? This is super exciting as someone who loves Old Navy, I am worried that their prices will still be inflated for their plus size line. I have stopped ordering from the plus size line online because it’s always more expensive when their XXL in stores is under the prices of the other straight sizes. Hopefully this will be a great addition and get me back in their stores for good! I do wish there weren’t so many large florals and sleeveless things. But that’s just me. **Praise hands** I’m over the moon that they are bringing it back! We will finally be able to shop for just about every occasion for my whole family in one stop! Usually I can get baby and husbands outfit but I have to order mine and gamble whether it will come on time and fit. Not to mention shopping for jeans will be cake now! I literally can not wait for this! It’s completely discriminatory. No doubt they will claim more material is needed, thus the prices will be higher…. yeah ok, but that doesn’t explain the lack of sales on plus size clothing. It’s shameful. In the post, I had shared that it will be available up through a size 30! Sorry if this was not clear! It’s so good. Larger women need and want fashionable clothes as well. Thanks. Yes!!!!! Hopefully they have it right. We shall see soon! This is awesome! I was so upset when they took the plus sizes out of the stores. I hope they can do some longer shirts with 3/4 length sleeves!! I’m so happy that Fashionable clothes for Plus Size ladies are coming out for Full Figured women. Beauty is in the Eye of the Beholder, also to the Women,who feels Beautiful in her Attire. Thank you, for all Women, and Me. I stopped shopping at OldNavy because they didn’t offer Plus sizes in the store, therefore when they had in store sales only we lost out. Also sometimes I want to try on the merchandise before purchasing. This may get me to shop there again. When?!? Where?!? I need more information stat. We linked to old navy’s page that shows which items are in store! What date will plus sizes be available in Old Navy stores? From what I can tell, now in select stores! I agree with the post about the lawsuit. Why should we support a store who for 10 years has all but banned plus size people from entering it! I actually prefer stores fhat do not separate plus size from womens wear. I love being able to shop for the exact same things as everyone else. Since I go up and down in weight from a size 10 to 18 I love being able to buy my style in every size. I will NOT enter an old navy at any size. I am curious to see how they try to right their wrongs… I will be watching. I’ll be approaching with veeeeerrrrry cautious optimism. I’ve been deleting their emails for years (should’ve just unsubscribed) because of the coupons that went out of their way to exclude plus sizes: 50% off for your whole ENTIRE family!! Excluding your fat family though!! Sorry not sorry!! And the clothes were the exact same “fast casual” quality with worse fit but cost three times as much. They certainly have a lot of work ahead of them after burning that bridge and bulldozing the ashes. Hopefully the shirts aren’t just tents with buttons on them anymore. I am here with you… it has been too long and with folks realizing that the plus market is 21 Billion, I am sure we shall see how this plays out, not only with them but with the industry! Honestly, I don’t see myself going back to a brand that abandoned the plus-size customer. I’ll get yoga pants, but I don’t see myself really going back. I’m glad. Old Navy used to be one of my staple stores but the styles and sizing was all over the place. I’m on the smaller end of plus so sometimes I can find things that work in straight size. Ordering online for the plus sizes was too hit or miss, they were priced too high and never seemed to go on sale. I recently bought some things in store and online for a vacation, and they seem to be back on the up and up. Hoping they do right by their plus size line with adequate inventory and good placement in store! I hope so toooooo!!!! Girl can you imagine if they keep this up? I searched and found this article after hearing Old Navy’s latest commercial that declares near the end “Yes! We have your size” after stopping shopping there in 2006 because I felt extremely unwanted as a customer when they removed the Plus section from their stores originally. While I’ve recently lost weight and no longer shop in the Plus section, I’m still wary of ON’s motivations and believe this is only being done because they’re greedy and realized that they have ticked off a lot of paying customers. If they really want to bring us back, they should try making their Plus clothes more size appropriate and flattering which means less sleeveless designs, less horizontal stripes, and slightly longer length hemlines for a good start. In addition, they should put out advertisements that specifically woo back the Plus customers who they lost when they relegated us to online only so as not to “fat up” their stores. Personally, I would rather give my money to businesses that respect me and never stopped than those who change their tune because their wallet is suffering the consequences of their actions. Fat shaming in the clothing merchandise industry is a real thing and Old Navy is guilty as sin. Old navy will get back a lot of customers with myself and my friends. I spent SO much money at Old Navy. Weekly money. I bought for my whole family. When I walked into my local Old Navy and couldn’t find their plus sized section years ago I walked out crying and refused to shop there. It was degrading to feel like they just tossed me away when I was such a loyal customer. I don’t mind paying more. It cost more to use more fabric. When they just made my section disappear, I felt so defeated. I will spend a lot of money again if they put plus back in the stores. They brought back the plus size for women, what about men?? ?